Free Enfagrow A+ Nutritional Powder Sample for 2-6 Year Kids – Enfagrow.co.in. The World’s No. 1 children nutrition brand* is now available in India. 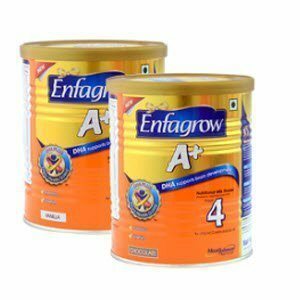 Enfagrow A + is a fortified nutritional powder for children aged 2 years and above. Enfagrow A+ helps your child’s growth and development in 3 ways: Brain development, Immunity and Overall physical growth & health. Select Prefered Product Chocolate or Vanilla. Soon representative will call you to verify address. Item will be shipped to your doorstep for free. The 2-6 year period of your child’s life is very important, as this is the time when the brain grows and develops rapidly. It is critical that your active child receives a steady source of energy and essential micro and macro nutrients to support his developing brain and overall performance, such as memory, attention, and problem solving. Intake of a well-balanced diet helps support your child’s brain development, physical growth and improves his/her ability to fight off infection and disease. Right nutrition also helps your child achieve learning potential to the fullest. Your child develops key brain activities like the sense of touch, speech abilities as well as thinking and reasoning capabilities before 6 years of age. Hence, the first 6 years are critical for the development of Intellectual, Motor, Communication & Emotional Skills. However, research shows that key nutrients like Choline, Zinc, Iodine, Iron, Vitamin B1, B6, B12, Folic acid and Protein may be inadequate in an average Indian child’s diet (Source: NFHS-3 Data). Also, DHA, a building block of the brain, is difficult for the body to make by itself. Hence, DHA has to be supplemented through external sources like fortified milk. Regular intake of fortified milk formula can be a good source of nutrition and helps fulfill macro & micro nutrient requirements (when taken as part of a balanced diet).